With the closing last season of Axel & Harrys and The Skyway, we were happy to see The Goat Soup & Whiskey step up to fill the "fine dining" culinary void. Island guests know that The Goat has been here for a number of years, but this year marks some new changes and improvements. The bar drinks have been kicked up a notch with the addition of fresh-squeezed juices and an assortment of new drinks based upon them. According to Scotty Jackson, Goat co-owner, "We press our own juices for the bar drinks daily, a practice we picked up in Costa Rica this past winter as we were researching our new drinks for the season." We hope they do some research in to Spanish or Italian food this coming winter and let us tag along! But seriously, the drinks are phenomenal, fresh, and moderately priced ($5.00 - $8.00). No stop at The Goat would be complete without a cup of soup ($3.95, $6.95 for a bowl). 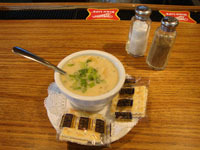 The soups here are so popular and widely known, that instead of a daily drink specials board, they have a soup board! Their Chicken Green Chili is the only regular soup served daily. Head Chef, Bob Moon, brings out three to five different special soups every day. A few recent options: Gazpacho, Chicken Curry, Split Pea, Cold Melon Compote, Tomato Basil, and our favorite, the Lemon Chicken soup. The lemon chicken had shredded chicken in abundance with a slightly creamy broth which hid some nice big chunks of carrot, potato, and celery. Diced green onions fancifully garnished the top and provided that little bit of crunch for texture. The lemon was very very subtle, but left a great aftertaste on the palate. Part of the reason for The Goat's phenomenal success and myriad of delectable dining options is their back-to-the-Earth philosophy. With rising fuel costs, it is great to see them favoring local farmers. Says Jackson, "We grow our own herbs and vegetables in our garden out back and whatever we can't grow we get locally from Bergman Orchards just across the water on the mainland." Fresh is always better and you can taste it in their food, especially the soups. But there is much more than soup (and whiskey!). 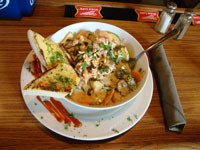 With a full menu, The Goat appetizers offer some great starters, especially if you are enjoying some drinks. 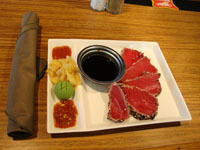 Tops on the list is the Pan Seared Tuna ($14.95). The tuna is sashimi grade and quickly pan seared to give it that crust on the outside while staying cool and pink in the middle. A change-up from last year sees the tuna lightly rolled in multi-colored sesame seeds instead of the peppercorns from last year. Personally, I would opt for a mix of the two, as the peppercorns gave a great little bite to the tuna. This dish is served with Soy Sauce, Wasabi, Pickled Ginger, Sriracha, and regular Chili Sauce. There really are no bad options on this menu, be it an appetizer or an entree. We have been eating at The Goat for years and tried just about every item with no complaint. Other delicious appetizer options include the Reuben Balls ($9.95) served with a thousand-island style dipping sauce. You may be asking yourself if this would really be possible and let us assure you, it is! Imagine your corned beef, swiss cheese, and rye bread crumbs mixed up and packed up in to little balls, breaded, and quick dipped in the frier. They literally explode with ooey gooey goodness. Also a favorite, the Pierogies ($9.95) served with a side of sour cream. These ain't the little frozen pierogies from a box you find at Kroger. No sir! These, just like almost everything else on the menu, are home-made, and garnished with home-grown herbs. Now comes the hard part... choosing one of over 40 options for your main course. There is a nice selection of all-day sandwiches and a nicer selection of dinner options served after 5pm. We opted to try a few different courses and split them amongst ourselves. This is not a white-linen service serving up teeny tiny taster-size over-priced "meals", but rather larger comfort food size portions which are easy to pass around if so inclined. 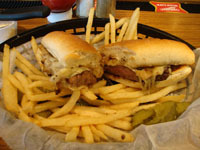 Such as the Steak Sandwich ($13.95). This is an entire ribeye steak, cooked to order, smothered in sauteed onions and a mound of melted swiss cheese served atop a big fluffy hoagie roll with some horseradish to add, if needed. It may not have been actually needed, but it spiced things up just the right amount. The sweet carmelized onions balanced perfectly with the tangy horseradish to complement this delicious meal on a bun. Our second "sandwich" to be shared was the infamous "Perch Tacos" ($12.95) that The Goat is known for. "It is our main signature dish which has guests coming back year after year," explains Jackson. They evoke memories of surfing back in Baja Mexico when I was in college back in the '80s, albeit a different fish. Once again, fine dining flair and flavor, that you can eat in your flip flops. No worries if some of Pali Wali's secret sauce drips out the end, or you drop a few pieces of cabbage or tomato or onion on the table. Fish tacos are meant to be a little sloppy and these are no exception! There are also the usual assortment of necessary comfort sandwiches for those who don't wish to stray far from their home kitchens or expand their culinary knowledge... Burgers ($9.95 and up), Reubens ($10.95), Grilled Cheeses ($6.95), and BLTs ($9.95) are all popular. As it was after 5pm, we decided to order a couple dinner entrees as well and see what all the fuss was about with their new items. First up was the Thai Pasta ($12.95, $16.95 with chicken, $19.95 with shrimp). This was added late last year to the menu and makes a bold new appearance this summer with a new twist. Instead of the egg noodles used last year, Chef Bob Moon has opted for traditional rice noodles like you would find in an authentic Thai restaurant. This meal can be served up either vegetarian style or with a couple different meat options. We opted for the chicken, but our neighbor at the next table saw ours and ordered a shrimp thai pasta that was just arriving as we left, and it looked delicious as well. The base of this dish, with or without meat, is a heavy green curry coconut sauce. It binds all the pasta and veggies together and infuses an authentic flavor throughout. You get a hint of fish sauce in the background which is just perfect for our Western palates that are not used to this everyday SouthEast Asian condiment. Green Onions, carrots, broccoli, and what appeared to be water chestnuts provided good texture to slurp down the rice noodles and healthy chunks of chicken. Oddly enough, this was served with garlic bread, which was about the only negative that could be found in our entire meal. While the garlic bread was delicious, it clashed a bit with the Thai Pasta. Next up was the new Beef Bourguignon (say THAT ten times fast!) ($18.95). Apparently there was much discussion and wine drinking over the winter and the result is this excellent wine-based entree. Taken from an old family recipe, according to Jackson, this was brought in to replace the beef stroganoff for a slightly lighter and lower-calorie entree. Lots of good red wine provides a swimming pool for some great quality beef filet mignon to simmer in and tenderize all day long. You can tell that the beef brought many friends swimming with big happy mushrooms, large shallots, and deliciously rendered chunks of bacon all making an appearance. The broth/sauce/juice is slightly thickened to hold everybody together and ladeled over wide strips of pasta which are just al-dente enough to absorb some of the mouth-watering juices. Some of their previously mentioned fresh garden herbs adorn the top and sides of this dish making it not only smell incredible, but look almost too good to eat. Yes, almost. We ate it anyway! And there was not a drop of sauce left after we used the hunk of garlic bread (perfect for THIS dish!) it is served with to mop up all traces. We were way too full to even attempt dessert, although we did somehow find room for another beer (Leinenkuegel Berry Weiss, $4.00). Their desserts are always made daily at The Goat and if you possibly can squeeze in more food in your belly, you more than likely will not be disappointed. We have had some incredible Apple Cobbler in the past and when Bob makes his Peach Pie, it is gone by the time it hits the board. Don't tell them we told you this, but there is also a Chocolate Museum downstairs if you need to curb that ice cream fix. You can reach The Goat Soup & Whiskey by calling 419.285.4628. You also can follow them on Facebook at http://www.facebook.com/pages/The-Goat-Soup-Whiskey/153221124719855 or e-mail them at TheGoatTavern@aol.com . This website is meant to showcase the Put-in-Bay, Ohio food scene. Monthly reviews of Putinbay restaurants occur during the season. When there is a festival involving food or wine in town, then that is covered as well. Put-in-Bay Bars get occasional notice for the quality of their drinks and entertainment. Each review is as unbiased as the palate of the reviewer (unless brussel sprouts are involved, that is a dealbreaker!). The mystery reviewer is an island resident who has been boating and working on the island for over 15 years and can remember back to the days when there was a Taco Bell on the island and the downtown bars closed at 11pm. Times change, but everyone still needs to eat!